WELCOME TO CHATRA : "The Gateway of Jharkhand"
The Chatra district is situated in the extreme northwest part of Jharkhand. The district came into existence in 1991, was previously a part of Hazaribagh district. The district is bounded on the north by Gaya (Bihar State) district and Hazaribagh district and on the east by Hazaribagh district, on the south by Palamu and Ranchi district and on the west by Gaya (Bihar State) and Palamu district The major portion of the Chatra district is covered by forest (more than 60%) and has scattered settlement patterns. 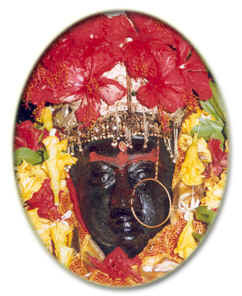 BHADULI, (Bhadrakali), KOLHUA HILL, KAULESHWARI DEVI, KUNDA CAVE, TAMA SIN. 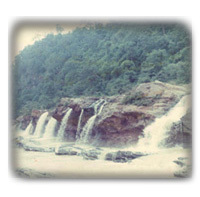 WATERFALLS: Bichkiliya, Duari, Khaya Banaroo, Keridah, Maloodah, Dumer Sumer, Goa, Barura Sharif, Gogri etc. 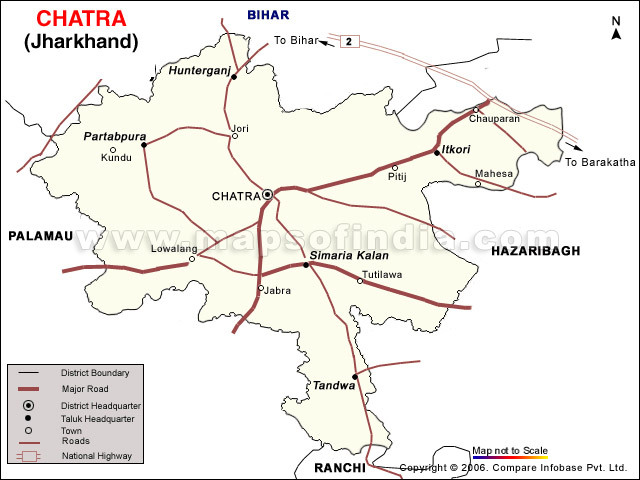 Rail:Chatra is near Dhanbad, which is on the main Delhi-Howrah railway line. Road:Well connected with all the major cities by good motor able roads. 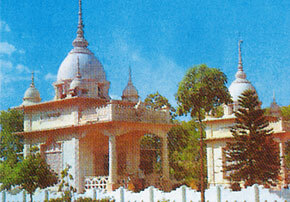 BHADULI (BHADRAKALI): BHADULI (Bhadrakali) is 35 kms. on the East of Chatra and 16 kms. west of Chauparan connected with G.T. Road. It is only half a km. away from Bhdrakali complex of Itkhori block headquarters; situated on the bank of river Mahanad(Mahane) surrounded by hill and forest. There is a water reservoir which has a natural beauty of its own. People flock to watch its eternal beauty on ' Bishua' (Kartik Purnima- a festival after Chhath) and enjoy bath & sun bask. 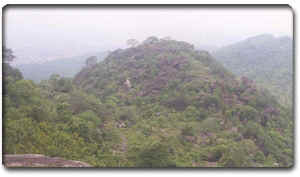 KOLHUA HILL: Kolhua hill lies about 6 miles south east of Hunterganj. At hunterganj one has to cross the lilangen river which is now bridged and jeep or walk through the uneven track to the foot of hill. The height of the hill is 1,575 feet and from the top one can find an excellent view. The top of the hill is quite distinctive and is known as " Akash Lochan"(Sky Eye). There are some ancient temples, the most important of which is a temple of ' Kali' known as 'Kauleshwari Devi'. KAULESHWARI DEVI: On Basant panchami and Ram navmi days, a large number of pilgrims flock to the hill top for worship. Sacrifice of goat in front of the temple is common.The temples and images are now a place of pilgrimage for the Hindus. 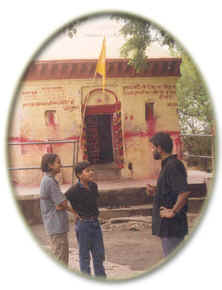 Dr.M.A.Stein, however, who visited the hill in 1900, was satisfied that they were built by the Jains, who venerated it as the birth - place of the tenth Trithankar, Sitala Swami, and fragmented it about 150 years ago. He felt that it was now entirely unknown to the ordinary jains and is associated by the local Hindus with Pandwa brothers. One of the specimen is a rock cut group of ten Digambari Jain Trithankars. KUNDA CAVE: Kunda Cave:- The ruins of old Kunda palace are still found at a distance of about three- four miles from the present Kunda Village. The place might have been created either towards the end of 17th or beginning of the 18th century AD. The walls are still standing though in a very much dilapidated condition, Still attracting a large number of visitors from out side. But the main centre of attraction for the illiterate public of places far and near is a Cave situated at a distance of about half a mile from the remains of the old Palace probably dug shortly after the building of the Palace. A narrow path runs downwards from the southern portion of the palace and leads to the cave. A shallow stream , which can be crossed without letting the feet touch the water surface, washes the brace of the cave. TAMA SIN: It is an attractive beauty spot of Chatra situated on the north-east at the distance of 26 kms. It is to be travelled through a 'Katcha' fair weather road via village Kolhaiya,.There is a big reservoir of water at foot. It is famous for the image of Goddess Bhagwati. Here one can enjoy the scenic beauty of the gorgeous water fall forgetting the worries of life. Tamasin has a break up of 'tamasin' which means 'darkness prevails '. This area is full of mixed forest having high trees making the area dark even in the daylight .Tamasin is mainly famous for a very beautiful waterfall which is awaiting the due love of the tourists.This area deserves a place on the tourist map of India. 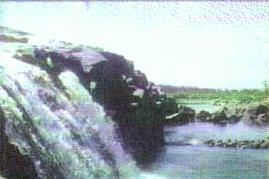 BICHKILIYA FALL: It is 'Dah' or water reservoir on the bank of river Niranjana(Lilajan) at the distance of 11 kms . from Chatra in west. The road up to 5 kms. is motorable and the rest 6 kms. is a foot track. It is lovely to look at the water fall foaming snow-white showers with musical tone inviting the lover of nature to have solace in the lap of nature. Due to inaccessibility this nice picnic spot has become adventurous. DUARI FALL: It is also known as Balbal Duari situated at the distance of 35 kms in the East of Chatra district on Gidhaur -Katkam Sandi Road. It can be reached from Hazaribagh also. The road is motor able and one can visit this directly form Chatra. During rainy season it is difficult to travel but it is pleasant in winter and summer. 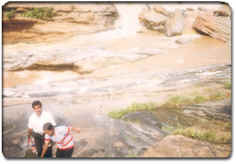 There is a hot spring in the bed of river Balbal near the village i.e. Duari. The water is supposed to have curative effect on skin diseases. As in Rajgir here people flock to have hot bath for obtaining remedial effect .In the same way on Makar- Sankranti people gather here in a large number to have a holy dip. The sight is also charming & delightful. 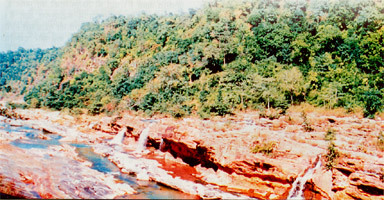 GOA FALL: It is a beautiful water fall at the distance of 6 kms. on the west of Chatra on way to Maloodah. Up to 4.5 kms. it can be reached by jeep and the rest 1.5 kms. can be tracked on foot. The water falls in the reservoir from the height of 30 ft. On all the three sides there are rocks and in middle there is a reservoir On each Monday during the month of Shrawan (rains) people flock here in multitudes, take a dip and enjoy jumping in the fall. It is the nearest picnic spot of Chatra District. DUMER SUMER: It is also another important beauty spot of Chatra situated on the North at the distance of 12 kms. of which 10 kms. can be covered by vehicle and the rest two kms. is a foot track. The road is Katcha. It looks nice to see the water fall from such a height. It appears as if the spring is dashing against the rocky walls fomenting white rays. One feels as if he is enjoying shower bath under the sun. Nights are lull with magical effect. 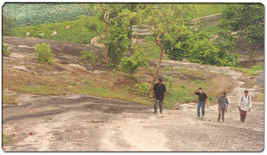 KHAYA BANAROO: This notable picnic spot of Chatra is about 10 kms. from the district headquarters on the south-west of the town. One can travel by 8 kms of metalled road on Chatra - Chandwa Road and 2 kms. by fair - weather motorable road, the rest 2 kms. can be travelled on foot. The woods are lovely, dark and deep. The scenery is resplendent in all its exquisitely green sylvan beauty.The dancing waves of the stream, foam at places, producing a gurgling sound is sure to attract the tourists since the whole valley appears to be echoing with the sound," O listen for the vales profound ! ".